Tadcaster Albion played out a second goalless draw in just over a month with Welsh outfit Colwyn Bay in Evo-Stik Division One North. There was no score between the sides when they met at the i2i Stadium in mid-January, and it was the same story at Llanelian Road on Saturday, the Brewers staying put in 15th place in the league standings as a result. Albion boss Billy Miller named an unchanged starting team for the third successive match, a first for the season. There were a few new additions to the bench however, with i2i International Soccer Academy athletes Ilyess Jeridi and Leon Pohls taking their places in the squad for the first time. The travelling Taddy fans were in fine voice all afternoon but it was the home side who looked to force the issue early on with Danny Bartle and Scott Bakkor both going close. Bay continued to look the more assertive, and captain Sam Barnes glanced narrowly wide of the mark. With Tom Corner and Josh Greening up front, Taddy always offer a threat, and the aforementioned Corner missed a glorious opportunity to ripple the back of the net before half-time. Jordan Armstrong galloped down the right wing and delivered the perfect cross for the towering frontman, but he misjudged the flight of the ball and ended up shouldering agonisingly over the crossbar from just five yards out. Taddy came out in the second period and took to the game to their Welsh opponents and almost found a way through 10 minutes in. Josh Greening performed a sumptuous piece of skill to beat Danny Collins before seeing his through-ball fortunately make its way to Conor Sellars. With thepass dropping out of the sky, Sellars just had Bay goalkeeper Kieran Wolland to beat. The Tad attacker side-footed first time on the volley and his effort almost squirmed underneath the gloveman, but Wolland managed to trap the ball under his legs and collect. Bay have struggled for form in recent weeks, slowly slipping down the division, but they were gifted a clear sigh of goal four minutes later. A ball over the top chased down by Bartle caused the Brewers problems as keeper Chandler Hallwood rushed off his line but missed the ball. With the goal open and Josh Barrett busting a gut to get back, Bartle panicked and blazed well over from an acute angle. In a game lacking in quality, both sides looked assured in the main defensively but neither quite had a clinical edge in front of goal. Taddy’s penultimate chance of the afternoon came five minutes from time when Josh Greening was pulled back right on the edge of the penalty area. Set-piece specialist Sellars stood over the free-kick but could only curl straight into the hands of Wolland. Both the Brewers and the Seagulls will think they could have won it late on with a couple of opportunities. 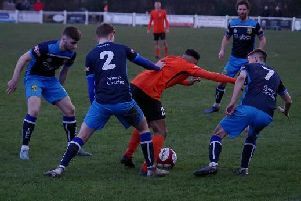 Jamie Rainford signed for Bay from Glossop North End a fortnight ago and he couldn’t have asked for a better chance to open his account for his new team after coming off the bench. He played a lovely one-two inside Taddy’s penalty area, but when afforded the chance to shoot, the striker could only turn tamely into the path of Hallwood. The last action of the match was a half-hearted penalty appeal from Albion, deep into injury time. Substitute and Monday night’s match winner Carl Stewart felt he was pulled back by defender Matty Regan, but referee Ben Atkinson was unconvinced and the game ended 0-0.